A body of the United Nations announced that the Federal Government of Somalia contravened the constitution of the UN’s specialized agency for labour, International Labour Organisation (ILO), and dishonored Somalia’s obligations under the constitution of the Organization. Credentials Committee of the ILO – elected by the ILO conference from New Zealand, Denmark and Mexico – meticulously scrutinized an objection lodged by the International Trade Unions Confederation (ITUC) against the government of Somalia for failing to comply with article 3(1) and (5) of the ILO Constitution as it had prevented the legitimate and most representative workers’ organization, Federation of Somali Trade Unions (FESTU), from being nominated as Workers’ delegate to the Conference. ILO ruled that Somali government failed to complied with its constitutional obligations under article 3(5) of the ILO Constitution. 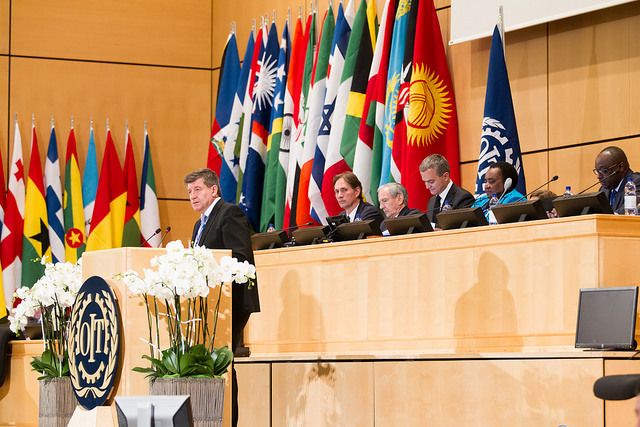 “The unilateral withdrawal of the tripartite delegation agreed in February 2017 and its unilateral replacement with another nomination in May 2017 demonstrates interference, in breach of the requirements set out in article 3(5) of the ILO Constitution” said report by the ILO Credential Committee which was unanimously endorsed by more than 4000 delegates attending the 106th session of the International Labour Conference. In the objection against Somali government, ITUC accused Somali government for committing fraud by accrediting an asylum seeker in Finland for alleged persecution from Somalia and Ministry of Information agent as workers’ representatives under the cover of an organization established by the government and persons associated with it in order to undermine the independent and representative trade unions in the country. 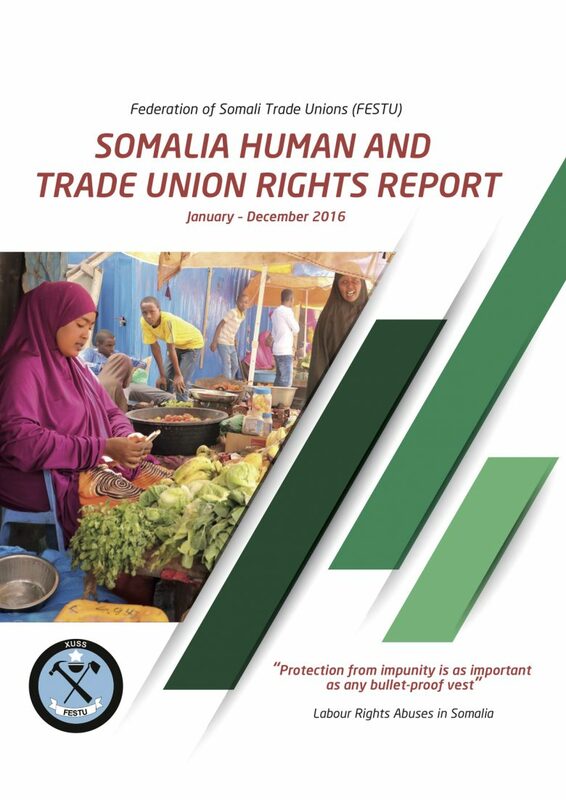 The decision of the ILO vindicates the complaints of the Federation of Somali Trade Unions (FESTU) and the International Trade Unions Confederation (ITUC), that workers’ and trade union rights’ have been abused and trampled on by the Ministry of Labour and Social Affairs. ILO’s Committee on Freedom of Association unearthed Somali government for committing serious violations of freedom of association and failure to observe international labour standards that it freely ratified. “ILO decision puts the country in bad light. It means the country does not adhere to the rule of law because these rules and conventions are about International Standards; so if a country does not adhere to the rules and conventions, which were agreed internationally and ratified by Somalia, it means this country, does not abide by the rule of law,” said Omar Faruk Osman, FESTU General Secretary. FESTU faults the Ministry of Labour for allowing the government to be the laughing stock of the conference when the conference learned with utter surprise that it accredited an asylum seeker and government agents as a workers’ delegates. “The government is collectively hold responsible for the disorderly actions of the Ministry of Labour and Social Affairs, which is hostage of the previous regime’s illegal actions. It portrays the government as unruly and a standing joke in international fora. This is totally controverting the reformist agenda of President Farmaajo and Prime Minister Khaire” declared Osman. Despite government’s failure to comply with ILO rules, FESTU delegation were invited to the ILO conference and held high level engagements with ILO Director General Guy Ryder and other senior officials of the UN body as well as representatives from international trade union community. By virtue of articles 26quater and 26bis(7) of the ILO Conference Standing Orders, ILO placed Somalia under monitoring, which is a class of ne’er-do-well governments who repeatedly disobey international rules.